Pixies are small mythological creatures that steal and deceive people, especially because they are afraid of their Queen who rules tyrant and constantly demands new presents. 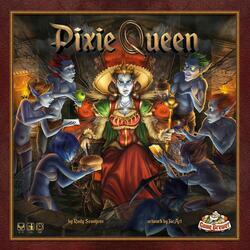 You play as Pixies Chefs doing their best to satisfy their Queen. At each turn, collect gold, money, and food for the Queen. Offer her golden rings, surprise her with an improvised gift or offer her one of your following as royal servant. But the Queen is not easily satisfied. She will constantly distribute points of punishment to the less zealous workers. To win the game you will need to collect as few punishments as possible.